“Conspiracy Theory!! !” cried the New York Times in its recent attempt to defend John McCain against revelations that show the Senator from Arizona providing material support to terrorism. 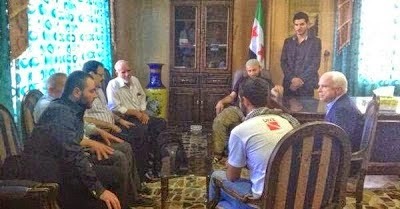 The NY Times was called into action to “debunk” the evidence that McCain had met with terrorists, cannibals, and ISIS militants in Syria after the photographs of those meetings began circulating in the alternative media and more mainstream figures began to pick up on and run with them over the last few months. Senator John McCain was one of the earliest advocates of American military action against the Islamic State in Iraq and Syria. So it has been vexing for Mr. McCain to be battling persistent — and false — Internet rumors that he not only helped invent the group but also knows its leader, Abu Bakr al-Baghdadi, the self-proclaimed caliph of the Muslim world and America’s latest Public Enemy No. 1. 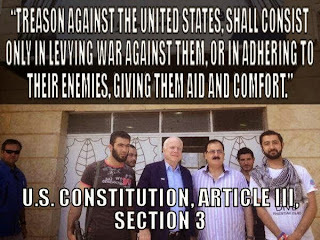 The rumors are based partly on images of a Syrian fighter who resembles Mr. Baghdadi, seen in photographs with Mr. McCain — some originally posted on Twitter by the senator — during his visit in May 2013 to northern Syria. He met members of the Free Syrian Army, an insurgent group that opposes ISIS and that President Obama, in a speech Wednesday on his new strategy for battling ISIS, has vowed to strengthen. Nurtured by conspiracy blogposts, social media and photo-altering tricks, the false rumors of Mr. McCain’s relationship with ISIS have taken on a life of their own. While the NY Times denies the photographs showing John McCain and Baghdadi together, it freely admits that McCain met with the Free Syrian Army, itself a terrorist organization responsible for indiscriminate killings, imposition of sharia law, murders, rapes, cannibalism and more. In Syria’s largest city, Aleppo, rebels aligned with Al Qaeda control the power plant, run the bakeries and head a court that applies Islamic law. Elsewhere, they have seized government oil fields, put employees back to work and now profit from the crude they produce. Across Syria, rebel-held areas are dotted with Islamic courts staffed by lawyers and clerics, and by fighting brigades led by extremists. Even the Supreme Military Council, the umbrella rebel organization whose formation the West had hoped would sideline radical groups, is stocked with commanders who want to infuse Islamic law into a future Syrian government. Even one of the FSA commanders, Bassel Idriss, recently admitted to openly collaborating with ISIS and al-Nusra, revealing yet another example of the fact that the “moderate rebels” are not moderate at all. Idriss also admitted that many FSA fighters had pledged allegiance to ISIS. He said, “[ISIS] wanted to enhance its presence in the Western Qalamoun area. After the fall of Yabroud and the FSA’s retreat into the hills [around Arsal], many units pledged allegiance [to ISIS]”. Not only the FSA, but also the Syrian Revolutionary Front has also openly admitted to working with Nusra and al-Qaeda. The leader of the SRF, Jamaal Maarouf admitted that his brigades coordinate with Nusra and al-Qaeda regularly. In the outskirts of Aleppo, the FSA has implemented a Sharia law enforcement police force that is a replica of the Wahhabi police in Saudi Arabia -- forcing ordinary citizens to abide by the Sharia code. This is being done in a secular country which has never known Sharia Law. This type of action is currently also being implemented in northern Mali, where the West has officially declared its opposition to the al-Qaeda government that took control earlier this year. If what is happening near Aleppo is representative of what may happen if the FSA assumes control of Syria, the country may become an Islamic state. Is that really what the U.S. and other Western countries are intending to tacitly support? Indeed, the FSA has also been targeting the infrastructure of the country. One of the main power plants in Damascus was knocked out for three days last week, impacting 40 percent of the city's residents. Do 'freedom fighters' typically attack critical infrastructure that impacts ordinary citizens on a mass scale? The FSA long ago stopped targeting solely government and military targets. The FSA is no stranger to atrocities. The FSA is the “moderate opposition” that was filmed forcing a young child to behead a Syrian soldier. It is also the “moderate opposition” that maintained “burial brigades,” a system of mass murder and mass executions against soldiers and those who support the Syrian government. The burial brigades were only one small part of a much wider campaign of terror and executions implemented by the Free Syrian Army. Of course, the Free Syrian Army is merely the umbrella group of death squads carefully crafted to present a “moderate” face on what is, in reality, nothing more than savage terrorists. Thus, the FSA encompasses(d) a number of smaller “brigades” of al-Qaeda terrorists in order to cover up the true nature of its own ranks. One such brigade was the Farouq brigade, to which Abu Sakkar was a member. Sakkar, also seen in photographs with John McCain, was the famous rebel videotaped cutting the heart out of a Syrian soldier and biting into it. Yet, for all its noble attempts to protect McCain’s terrorist sympathies, the evidence the organization provides in his defense is incredibly weak. Note that the only thing the Times can produce in the way of evidence is a counter-claim that simply says the accusations are “internet rumours” and that the person in the picture with McCain simply looks like Baghdadi. The idea that he is Baghdadi is considered an impossibility. The only other offering in the way of McCain’s defense is a statement by his own Communications Director, Brian Rogers, who claims that the man in the picture was not Baghdadi but another individual associated with the Northern Storm Brigade, ironically a terrorist organization in its own right. Northern Storm was famous for kidnapping a group of religious pilgrims crossing through Syria in September, 2012. Nevertheless, the comparisons of the photographs and the individuals in them lean toward the idea that the terrorist in the picture is Baghdadi. Regardless of who it was, the individual was a terrorist since McCain’s defense is that it was a fighter/commander with Northern Storm. Has Rand Paul ever been to Syria? Has he ever met with ISIS? Has he ever met with any of these people? No. No. We’re gonna have a fight because it’s patently false. This is the same Rand Paul that said we didn’t want to have anything to do with anything by the way. I don’t want to get in a fight with him at all. But it’s not true. I know these people. I’m in contact with them all the time and he is not. He [McCain] had made an April visit to Benghazi, a city cited along with neighboring Darnah by a 2007 West Point report as the terror recruiting capitals of the world and the primary sources of foreign fighters that made their way to Iraq fighting and killing American troops. These fighters did so under the flag of the Libyan Islamic Fighting Group (LIFG), listed to this day by the US State Department as a "foreign terrorist organization." Despite overwhelming evidence and even admissions from Libyan rebels themselves of having ties to, being members of, or in Tripoli "council leader" Abdul Belhaj's case, a leader of this listed terrorist organization, McCain would declare he had "met with these brave fighters, and they are not Al-Qaeda. To the contrary: They are Libyan patriots who want to liberate their nation." Despite McCain's reassuring words, the rebels over the next several months would increasingly reveal their true nature to a horrified world as they waged racist genocide against Libya's darker and black tribes, and conducted their "liberation" against cities resisting them with indiscriminate heavy weapons, blockades designed to literallystarve the populations into submission and horrific reprisals once cities fell. While the corporate media did its best to obfuscate these atrocities, when entire cities like Tawarga with its 10,000 residents began disappearing from the map, even the propagandists were forced to acknowledge the "liberators" were less than noble. It should also be noted that McCain is extremely close to the color revolution apparatus organization, theInternational Republican Institute, a wing of the National Endowment for Democracy and USAID. In fact, he is the current Chairman of the IRI. While John McCain has proven his disloyalty to the United States time and time again – from his scuttling of Congressional inquiries into the existence of American prisoners of war in Vietnam to the support for obvious terrorists overseas, the mainstream media has consistently given him a pass on his treasonous behavior. It is thus important for every American to know that not only is there no such thing as a moderate opposition in Syria but that John McCain is no American hero. 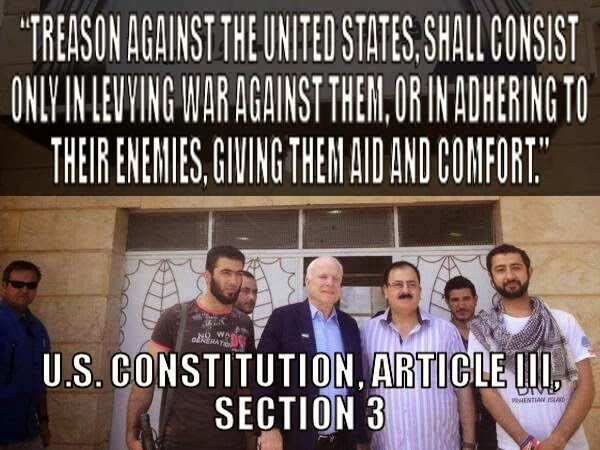 If the Americans mentioned in the recent AP report can be investigated, tried, and convicted of providing support for terrorists operating abroad then surely John McCain has earned his day in court. Tarpley, Webster G. Obama: The Postmodern Coup. Mowat, Jonathan. “A New Gladio In Action: ‘Swarming Adolescents.’” Progressive Press. 2008. Pp. 243-270. Brandon Turbeville is an author out of Florence, South Carolina. He has a Bachelor's Degree from Francis Marion University and is the author of six books, Codex Alimentarius -- The End of Health Freedom, 7 Real Conspiracies, Five Sense Solutions and Dispatches From a Dissident, volume 1and volume 2, and The Road to Damascus: The Anglo-American Assault on Syria. 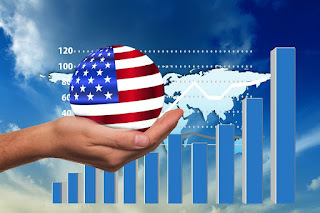 Turbeville has published over 300 articles dealing on a wide variety of subjects including health, economics, government corruption, and civil liberties. Brandon Turbeville's podcast Truth on The Tracks can be found every Monday night 9 pm EST at UCYTV. He is available for radio and TV interviews. Please contact activistpost (at) gmail.com.